The Euroleague Final Four is one of the most eagerly anticipated basketball events of the year. This is the championship of the Euroleague basketball competition and it showcases the four best teams from the league campaign. This format was first introduced back in the 1987/88 season and it has been recognised as one of the most exciting conclusions to a basketball season. 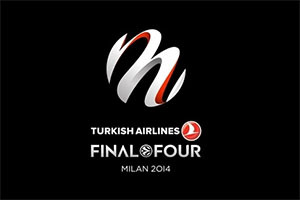 Currently, the Euroleague Final Four is sponsored by Turkish Airlines, which means the tournament is currently listed as the Turkish Airlines Euroleague Final Four. In the Final Four era, Panathinaikos are the team that has tasted most success. With 6 triumphs, from a total of 11 Final Four appearances up to the conclusion of the 2012/13 campaign, Panathinaikos can claim to be the most successful team at the event. The nearest rivals for the most number of wins in the event are Maccabi Tel Aviv, Split and Olympiacos, all of whom have three wins each. The fact that two Greek teams are in the upper rankings of the Final Four standings is a great source of pride for Greek basketball fans and officials. Teams who have won the event twice include FC Barcelona, CSKA Moscow and Virtus Bologna. Teams who have triumphed once so far include Real Madrid, Joventut Badalona, Partizan, Limoges CSP, Olimpia Milano and BC Zalgiris from Lithuania. With 13 different teams all having tasted success in the tournament, and with 25 different clubs in total having made it through to the Final Four stages, this is a tournament with a broad spread and appeal. FC Barcelona is the team that has made it through the to the Final Four on most occasions, 13 teams with CSKA Moscow having made it through to the Final Four 12 times. Panathinaikos and Maccabi Tel Aviv have both made it through to the Final Four on 11 occasions. The 2013/14 Turkish League Final Four features CSKA Moscow, Maccabi Electra Tel Aviv, FC Barcelona and Real Madrid. The Spanish giants face off in one semi-final, adding additional passion, excitement and drama to the event, although it is not needed! The 2013/14 Final Four is being held in Milan. The semi-final matches take place on Friday the 16th of May, the losers meet in the 3rd and 4th play-off match with the two winning semi-finalists meeting in the Grand Final taking place on Sunday the 18th of May. When it comes to making a difference, players will know that they have to bring their best to the tournament and the Final Four MVP award is always hotly contested. Two players have clinched three MVPS in Final Four events, Toni Kukoc and Vassilis Spanoulis. Two players have clinched two MVPs in Final Four events, Dejan Bodiroga and Dimitris Diamantidis. 17 different players hold one Final Four MVP award to their name. With respect to nationalities, the MVP award has been presented to an American player on 7 occasions, a Greek player on 6 occasions, a Serbian on 6 occasions and a Croatian 4 times. The team who holds the most MVP awards for a player on their team is Panathinaikos, with 6 and then the next is Olympiacos, who have 4 awards. The most points scored in a Final Four is 69 points, an accolade which rests with Nikos Galis for his efforts back in 1988. It is interesting to note that the top 4 highest scoring achievements in the Final Four all date back to this period, but it is also interesting to note that Galis holds three of the top four positions. Galis is also second in the list of most points scored in a Final Four championship with 67 points in 1990, third place is held by American Bob McAdoo with 64 points in 1988 and then Nikos Galis again with 63 points in 1989. However, Galis never managed to fire his team Aris to victory in any of these tournaments. The individual point scoring records of recent years may not match the early excitement of the Final Four but there is still a lot of exciting and intriguing basketball on offer from the Turkish Airlines Final Four.